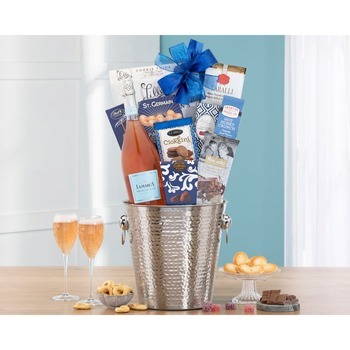 This elegant basket is perfectly suited for those who enjoy the finer things life has to offer. From weddings to graduations, ship christenings to New Year's Eve, Sparkling wine is the go-to bubbly for getting the party started. A bottle of La Marca Prosecco Italian sparkling wine is arranged with a wealth of tasty surprises. 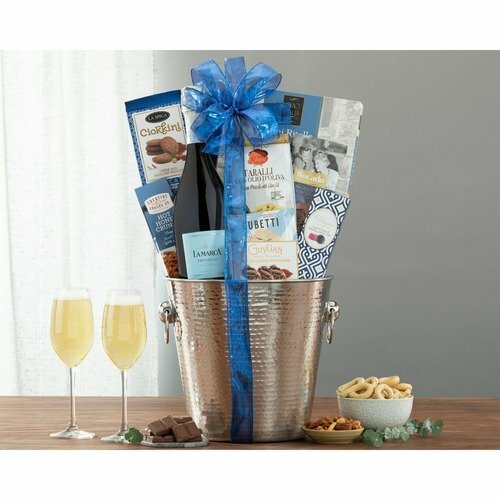 Chocolate caramels, garlic and herb cheese spread, tiramisu milk chocolate truffles, Godiva milk chocolate caramels and more complete this exquisite sparkling wine gift basket. * 1st in Flowers did it again - Just perfect!!! * I will NEVER use any other floral company other than 1st in Flowers in my lifetime!!!! Nothing is too much for the customer - and the AWESOME review I got from the recipient of my last order, including everyone in her family, was beyond expectation! * Very convenient and great quality products!